Can You Get A Paperwhite to Rebloom? If you’ve been gardening for a while, you’ve certainly heard that it is impossible to get a Paperwhite narcissus (Narcissus papyraceus, formerly N. tazetta), the popular Christmas-blooming daffodil, to rebloom. But it ain’t necessarily so! All the experts agree: you can’t recuperate a Paperwhite narcissus bulb that has been forced (grown indoors for early flowering). The only choice, we are told, is the trash or compost bin. That’s because blooming indoors is supposed to tire the bulb out, leaving it unable to bloom a second time. But that’s not my experience. I’m very reluctant to give up on a plant that shows even the slightest sign of life. So, about 15 years ago, after a pot of Paperwhite narcissus finished blooming in January, I simply cut off the faded flowers, leaving the leaves intact, and kept watering and fertilizing it. To my surprise, it remained healthy and green. When summer came, the leaves were still green, so I continued, but moved it outdoors. The foliage did die back in late July. I unpotted the bulbs to examine them. They were plump and healthy, had a solid feel and, in fact, looked much like the original bulbs. I stuffed them into a paper bag and kept checking on them. By late fall, there were pale yellow sprouts on each one, so I potted them up again and started watering. They bloomed again quite nicely in January (about a month later than the first time). I repeated the experience the following year, except I simply left them in their pot during the dormancy period, watering again only when the pale sprouts appeared. There was less bloom this time (the bulbs had divided a lot and were smaller), but still, they bloomed. I stopped the experiment after this third blooming. The bulbs had so divided there were only small bulbs left in the pot, none I judged big enough to bloom. So then I finally did toss them into the compost pile. After this first experience, I’ve tried twice more and both times had the same results: I can get at least 3 seasons of bloom from a Paperwhite narcissus under my conditions. I do try and grow them in full sun and fertilize regularly. Ideally, I’d like to grow them cool (below 50˚F/10˚C at night), as this gives shorter flower stalks that don’t flop, but I have no spot in my home that is both cool and sunny, so I simply stake them. I find the new cultivars, like ‘Ziva’ , ‘Galilee’ and ‘Jerusalem’ much sturdier and less needful of staking. Note that I grew my Paperwhites in potting mix, not in gravel, marble chips, or in water alone (all of which are often used for growing Paperwhites). My experience with this kind of hydroponic culture is that bulbs and thick-rooted plants (carrots, beets, etc.) simply don’t plump up in an aquatic environment: they seem to need the repeated stress of going from moist to nearly dry and back again to form a good bulb. So you would have to grow them in potting mix if you wanted repeat bloom. Also, if you live in a warm temperate climate (USDA zones 8 to 10), it would be far easier simply to plant them outdoors where they will bloom in January, February or March, depending on your local conditions. I’ve seen Paperwhites in bloom in several gardens in Los Angeles in late January, for example. So, the information that Paperwhite narcissus won’t rebloom is untrue: a sort of a horticultural white lie. Certainly, it is far easier to simply toss them when they finish flowering and buy new bulbs, but, again if you’re like me and like to experiment, it really isn’t all that hard to get repeat bloom from a Paperwhite! If any narcissus has a story to tell, it’s the Chinese Sacred Lily. Odd name for a narcissus, you say? Indeed, and that’s part of the story of this fascinating bulb that became China’s darling over 1,000 years ago. The botanical name of the Chinese sacred lily is Narcissus tazetta chinensis (some authorities prefer N. tazetta orientalis). Each bulb produces 4 to 6 flat green leaves and a stem up to about 16 inches (40 cm) tall with up to 8 honey/citrus-scented white flowers with a golden-yellow crown in the center. It’s closely related to the popular Paperwhite narcissus (N. papyraceus) and indeed, the latter was long considered a form of N. tazetta. After all, both are native to the Mediterranean region and are among the few subtropical narcissi (most narcissi and daffodils are hardy plants). The two do, however, differ by flower color (the Paperwhite narcissus, as the same suggests, is pure white) and by the number of chromosomes: the Chinese sacred lilies are diploids and have 11 chromosomes while Paperwhites are tetraploids, with 22 chromosomes. The Chinese sacred lily may have left its first mark on history as the rose of Sharon mentioned in the bible. It’s also one of the plants that might be Matthew’s famous “lily of the field.” That would make sense, as it does grow wild in Israel and indeed throughout the Middle East. However, there are many other candidates for those both, including anemones, poppies, gladioli and crocuses, and which plant was actually referred to will probably never be known. The Chinese sacred lily is believed to have traveled by caravan over the Silk Road. Some 1200 years ago, some enterprising camel driver probably felt that this winter blooming bulb with its beautiful white and yellow highly scented flowers might be of interest to the Chinese. To make things easier, the bulb remains fully dormant for 8 to 9 months each year and is therefore easy to transport. Carrying it 4,000 miles (6,400 km) over the Silk Road by camel caravan would not have been a problem. Another theory is that it was instead Arab or Persian traders who brought it to China over ancient sea-trading routes. Either way, it was being grown on a large scale in China by the beginning of the Song Dynasty (960). By then, it was already recognized as one of the symbols of Chinese New Year, because not only does it blooms naturally at about the right date (Chinese New Year takes place between January 21 and February 19, varying according to the Chinese lunar calendar), but its golden-yellow central crown is a symbol of good luck and prosperity. If it blooms on Chinese New Year, it is said to bring extra wealth and good fortune throughout the year. It remains a popular New Year’s plant to this day and in fact, is so widely grown in Asia it may well be the world’s best-selling bulb. In China, Korea and Japan, the bulb has also escaped from culture and grows wild in several regions. Botanists who found it there assumed it was a native, hence the botanical name N. tazetta chinensis. But the Chinese sacred lily had not yet finished its wanderings. Why lily and not narcissus? My guess is that gold miners probably weren’t too knowledgeable about horticulture! Unless you live in a mild climate (zone 9 or warmer), this is one narcissus you won’t be able to plant outdoors. Most readers of this blog will have to grow this tender bulb indoors, protected from severe cold. It couldn’t be easier to grow. Just place 3 to 5 bulbs in a 6 to 8-inch pot (15 to 20 cm). You can plant them in potting soil in a pot with drainage holes or even in decorative stones in a cachepot. Bury at least the base of the bulb so it remains solidly upright, but you can leave the top part exposed. Water well and, if possible, place the pot in fairly a cool place, at less than 65 ° F (18 ° C) at night. You could, for example, place the pot in the window of a barely heated garage, a protected veranda or a cold frame. Or set it in the refrigerator for about 3 weeks until plenty of roots have formed, before exposing it to more warmth. Even if you can’t supply cooler temperatures, the bulbs will still bloom, but will then tend to etiolate (stretch) and you may need to stake the stems. 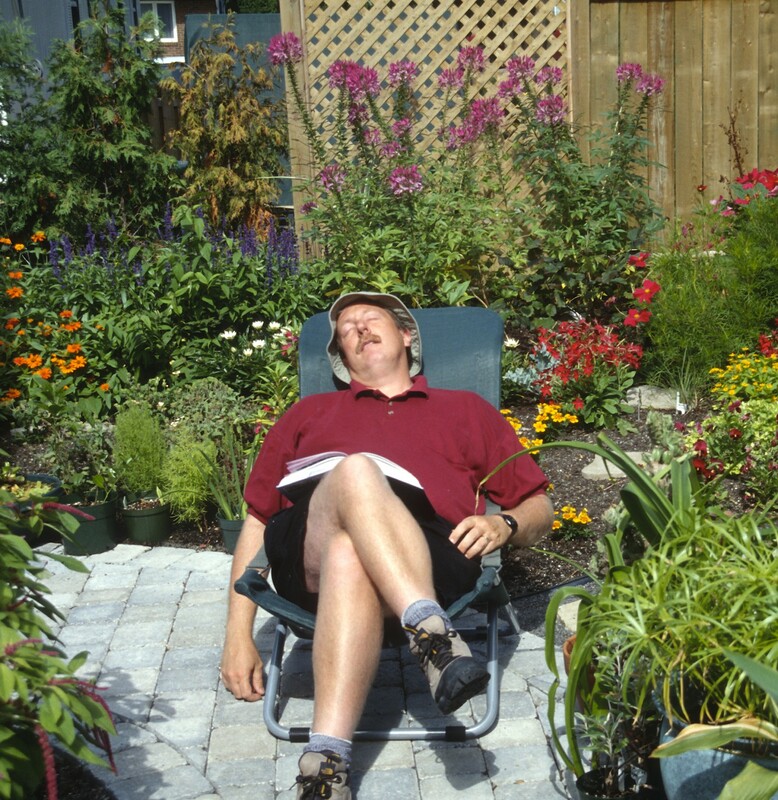 Giving it as much sunshine as you can is another way of keeping the plant more compact. Just keep their roots moist, watering well when the soil is dry to the touch. The Chinese sacred lily can easily tolerate normal indoor temperatures when in bloom. Most authorities suggest simply tossing the bulbs after they bloom, claiming they won’t bloom a second time, but I beg to differ. That may be true if you grow them in stones where they won’t be able to recuperate the minerals they lost when they flowered, but if you plant them in pots of soil, you can bloom them again and again. Just follow the plant’s normal growth cycle. For example, continue to water as long as the foliage remains green. Also, after flowering, start fertilizing the plant regularly. When the leaves finally do turn yellow, which can take two months or more, stop watering and fertilizing and allow the bulbs to go dormant. You’ll probably want to hide them from sight during spring, summer and early fall, but you don’t have to. Certainly, you don’t have to store them in the dark, another common misconception about dormant bulbs. (The plant will be dormant: do you think it cares whether it’s in the dark or in the sun?) Then, late next fall or early next winter, from November to January, start watering again and the plant will grow back and quickly come into bloom. In Bloom for Chinese New Year? Cultivating Chinese sacred lilies exactly on time for Chinese New Year is quite a challenge, as the holiday changes date according to the lunar calendar. Commercial growers of the bulb invest a lot of effort in precisely controlling growing conditions in order to have it bloom at exactly the right time. You can’t really expect to do as well as they do under home conditions. However, if you start watering about five weeks beforehand (Chinese New Year will be February 16 in 2018, so in early December 2017), you ought to be quite close. Personally, I don’t aim for a particular date. I’m happy to see this bulb flower whenever it wants to and I just start watering when I see the first signs of green growth at the tip of the bulb. The Chinese sacred lily is available from mail-order bulb suppliers and garden centers. Indeed, if I’m writing about it right now, it’s because I was able to buy a pack in my local garden center just this week. Look for it: it’s a most interesting plant with quite a history and certainly something to charm the earliest days of winter! Not all bulbs sold in garden centers in the fall are supposed to be planted outdoors, at least not in cooler climates. Paperwhite narcissus (now officially called Narcissus papyraceus, although it is still sold under its old name, N. tazetta) originally comes from southern Europe and northern Africa, a warm temperate to subtropical climate. Compare that to most other narcissus which hail from climates with cold, snowy winters: that’s quite a difference! 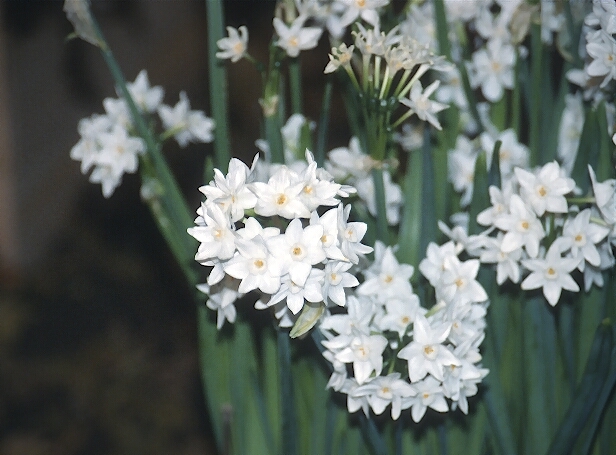 Paperwhite narcissus can be planted outdoors, but only in mild climates (zones 8-11). It is simply not hardy in temperate regions. Garden centers sell Paperwhite bulbs for forcing, that is, for growing indoors. And usually there is a photo accompanying the bulb showing it growing indoors in a pot. Still, it is a narcissus, so mistakenly planting them outdoors is not impossible. These days, there are many cultivars of Paperwhite narcissus on the market. I’ve seen the following names: ‘Galilee’, ‘Ziva’, ‘Nomy’, ‘Omri’, ‘Yalel’ and ‘Sheleg’. 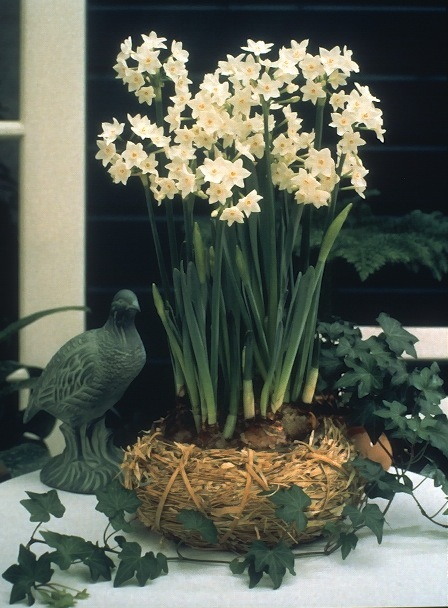 All are single-flowered narcissus with small, clustered, highly perfumed white flowers. In fact, they all look pretty much the same. The named cultivars are just a bit more compact and faster to bloom than the species. Paperwhites should be grown in pots. Plant four or five bulbs in a 6 to 8 inch (15 to 20 cm) pot. You can use potting soil or decorative stones. Bury the rounded part of the bulb: you can leave the tip exposed if you prefer. Water well and place in a sunny spot at cool temperatures, if possible. Nights below 65˚F (18˚C) are ideal. Some authorities suggest you put the bulbs in a dark spot a first and there’s nothing wrong with that, but it really isn’t necessary. Certainly they should be moved to full sun as soon as leaves start to appear… and that can be within days of planting the bulbs. If you can’t give the bulbs cool night temperatures, don’t be too concerned. The plant will flower well under warm nights too, but then tends to etiolate (stretch) and thus may need staking. Intense sunlight will help keep the plant more compact if you have no control over the temperature. Or get it drunk! Studies show that watering Paperwhite narcissus with a very dilute solution of alcohol will give a more compact plant. You choose the drink – vodka, gin, rubbing alcohol, etc. – but is has to be distilled alcool. 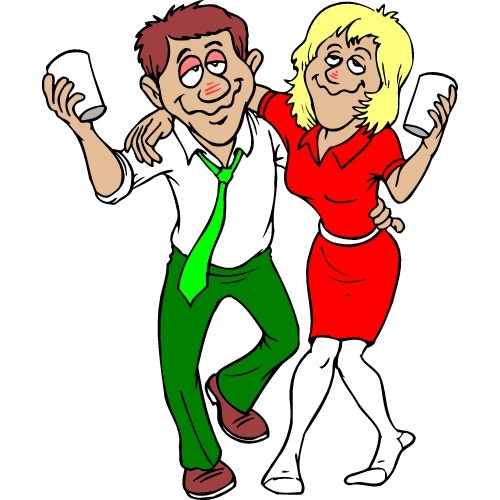 Avoid beer and wine: they contain too much sugar and that can stimulate the growth of fungi. Dilute the alcohol at a rate of 1 part to 8 to 10 parts water. After flowering, you might as well toss the bulbs into the compost bin, because they won’t bloom again. Or at least that’s what I was always told. I’ve discovered that this is not really true, that it is possible to recuperate Paperwhite narcissus bulbs and see them bloom again. Here’s what to do. When the flowers have faded, continue to water the bulbs through the winter and spring, preferably at cool temperatures (they will tolerate up to about 40˚F/4˚C). Give them full sun and fertilize regularly. Flowering causes the bulbs to shrink in size; it takes sun and minerals to get them to fill out again. Don’t cut off the leaves as long as they are green. When summer comes, you can put the bulbs outside. My experience is that the foliage lasts a long time, until July, sometimes even August. When it finally does start to turn yellow, stop watering. You can leave the bulbs in their pot or, if you prefer, dig them up and store them dry in a paper bag or a cardboard box. These ‘Galilee’ paperwhites are blooming for a second time. Late in the fall, although you haven’t watered for months, small pale yellow shoots will appear at the tip of the bulbs. This is sign they are ready to grow again. Pot them up again if necessary and start to water them, giving them the treatment described above. Soon your Paperwhites will be in bloom again. I found I could get my Paperwhites to rebloom once for sure, usually twice. After that, the bulbs had multiplied so massively that the bulbs were too small to bloom. I’ve never gone further than this stage and simply composted the small bulbs. 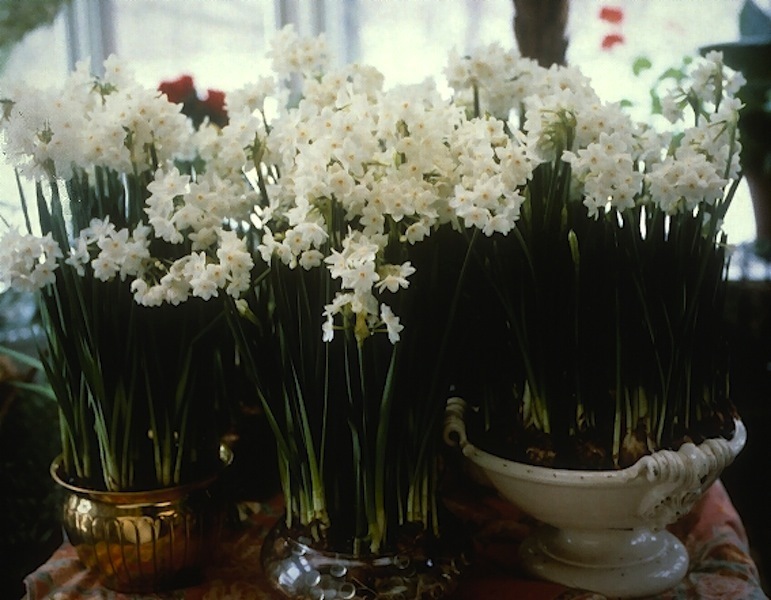 So, yes, you can recuperate Paperwhite bulbs… but it is much simpler to buy fresh bulbs each fall!